Plex Media Server is one of the wonderful streaming smarter, which has the ability of streaming digital media files, like music, videos and photos anywhere on all devices and players with the same local area network or over the Internet. I always use this media server to store media content for free up memory of my devices, since Plex can run on Windows, macOS, Linux, smartphones, etc. However, when you start to stream Audible audio books via Plex Media Server for combining your audiobooks, you will find out that it's impossible to stream Audible AA/AAX audiobooks directly. What happened? If you have to access to Audible audio files via Plex, what should you do exactly? To get more detailed information, please read on this useful article including the reasons and a professional solution. As a client-server media player system, generally speaking, Plex consists of two main components, namely Plex Media Server and Plex Media Player. Plex Media Server original called Plex Media Center is a media managing software bringing your favorite digital files together in one place. That's to say, you can organize audio and visual content from personal media libraries and stream wanted content to all of your devices. Plex Media Player also famous as PMP uses hardware acceleration for a consistent user interface across all devices. It is capable of playing local media files and stream added digital media. When it comes to the reasons why we can't stream Audible audiobooks via Plex Media Server, we should keep it in mind that books purchased and downloaded from Audible.com are encrypted by DRM copyright technology and encoded in AA/AAX format. Due to DRM protection, Audible audio books are limited to play on selected devices. Obviously, Plex is not included in the line. As for the AA and AAX files, unfortunately, Plex Media Server can’t detect and recognize such audio format. 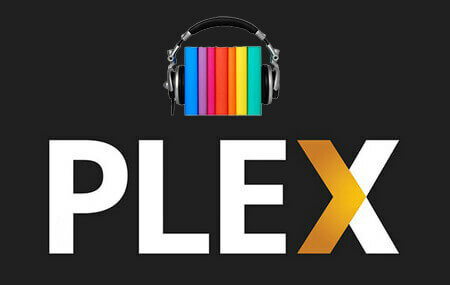 Right now, we have a full knowledge of Plex and Audible files. So what we should equip with to make Audible audiobooks compatible with Plex Media Server. Considering the fact that Audible audio files are encoded in AA/AAX format with built-in DRM restriction, we need to discover a powerful third-party Audible audiobook converter to help us convert DRM AA/AAX to other plain audio formats. 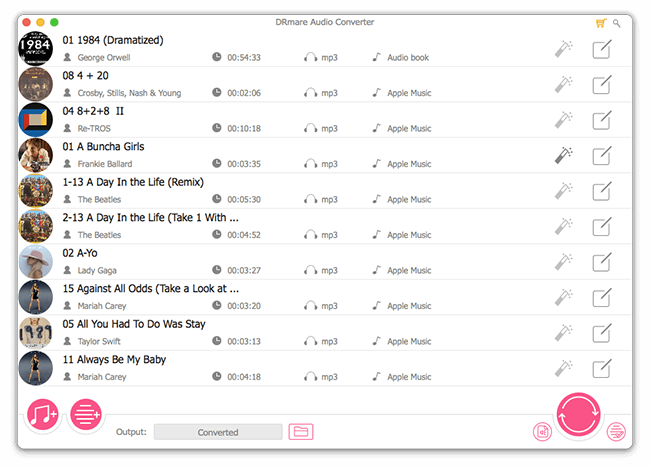 Here, we can meet DRmare Audible AA/AAX Converter for Mac/Windows, an all-in-one Audible DRM removal tool. 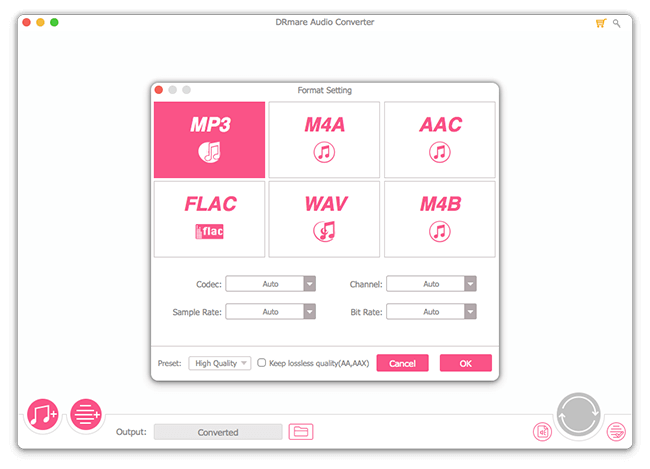 It can not only remove DRM protection, but also convert Audible AA/AAX to MP3, FLAC, AAC, WAV, or other Plex compatible formats. Although it costs a couple of dollars, it balances quality and speed, since this smart software can keep high output quality and support batch conversion at 30X faster speed. Anyway, I highly recommend you download its free trial version to test its features and performance firstly. Remove DRM protection from Audible audiobooks, iTunes audiobooks, etc. Now you can follow the step-by-step guide to tell you how to remove DRM proction from Audible files and convert audio books to Plex compatible formats without DRM restriction. Since Audible books are protected by DRM technology, you need to click the first '+' button at the bottom-left corner of the main interface to choose favorite Audible files from Audible library. Or you can drag and drop Audible DRM audiobooks to conversion window of DRmare software directly. 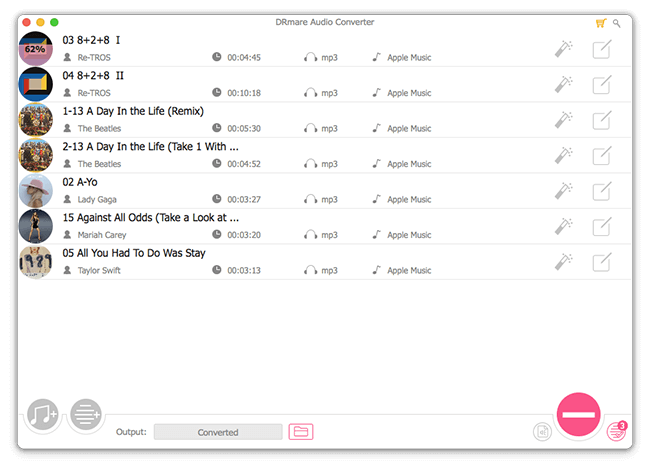 Plex Media Server is compatible with a wide variety of audio formats, like AAC, ALAC, FLAC, MP3, etc. You can simply touch the 'Format' icon that is very small and a new format window will pop up, you can choose one of the supported audio formats as the output format. Also, you are allowed to customize other output parameters, including channel, codec, sample rate and more. Tab the 'Convert' button at the right-bottom corner to initialize the conversion process. 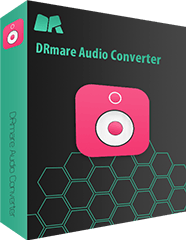 DRmare Audible AA/AAX Converter will automatically convert DRM protected Audible books to unprotected Plex supported audio tracks. It will take only a few minutes to finish the converting process. After conversion, you are freely to upload Audible audiobooks to Plex. Congratulation! You have gotten Audible DRM-free audiobook files in the destination folder on your computer. Now, it's your time to stream audio tracks from Plex Media Server. Here we go! Step 1. Plex Media Server is available for Windows and Mac operating system, you can just choose the right version to download and install it on your computer with Plex-linked account. Step 2. Once installed successfully, your computer will work as a media server. And you can launch this Media Server to upload Audible audiobooks from your computer. You just need to follow the screen prompt to get audio books on Media Server. Step 3. In order to stream Audible files to other devices, you should install the Plex client app on your target devices, too. Please make Plex Media Server on different two devices connected with the same local area network or over the Internet. Now, you are able to stream Audible files to the destination device from computer and enjoy converted Audible files from Plex Media Server. With the purpose of streaming imported Audible files anywhere on all devices, you might be required to get a premium subscription of Plex. But it’s really worth thing to stream media files to wanted devices through Plex Media Server, which can give you a great listening experience.